Once more I'm bending the rules a bit for SPA. The theme this week is nightsky but since I did a nightsky last week I wanted something a bit different this time and went crazy in stars. Until now I've just kept all my art postcards on my computer but with all the time, energy and feelings I pour into them I'm beginning to think it's almost a shame. So I'm considering starting printing them and maybe... just maybe do a little with them after they are printed. I haven't had a real paintbrush in my hands in years. I used to paint with watercolors and every time I see paper and watercolors at the store I can feel it pull me in. I might surrender at some point. Maybe when the weather is a bit better and I take it with me outside. Nature was always my main inspiration back in the days of analog creating. Materiels by Tangie Baxter, The Lilypad Designers and Lauren Bavin. Thank you for your poem night, love it! This is magical. Love it! 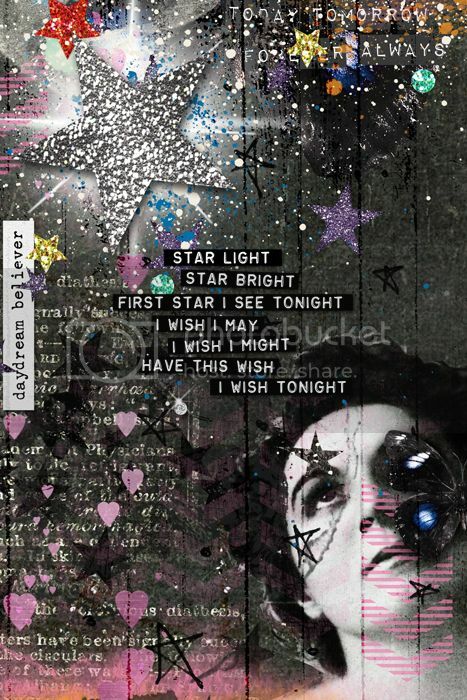 A magical wonderful collage...superb layering a great postcard. This is a gorgeous card! Think about mail art...you can send your art out into the world, AND you get art in return!